These suites are between 320 and 430 square feet in size. Each suite features a King size bed fitted with fine Egyptian cotton sheets. These accommodations come with excellent amenities, including a pillow menu, an LCD television and a hot tub where you can relax and enjoy incredible views of Lake Nahuel Huapi and the mountains. 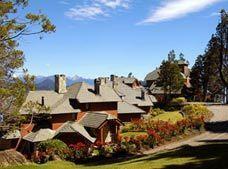 Experience an unforgettable stay in Bariloche when you choose one of these suites. 35% discount per room! Applies for stays between 14/Mar/2019 and 30/Jun/2019. If you want to completely relax then this guestroom with a private spa is the ideal option. You'll find a Jacuzzi with ozone therapy, a Scottish shower, a Finnish shower with color therapy, and a sauna with therapeutic essential oils. This room type also includes gourmet buffet breakfast. If you're seeking somewhere to relax your body and soul in privacy, then this suite is ideal for you. It has been equipped with a sauna, a Jacuzzi with aromatherapy, a Finnish shower, and a towel heater, among other exclusive amenities and services. Inside this suite comfort, luxury and good taste reign supreme, making it great for an unforgettable accommodation experience. The suite has a double Jacuzzi, a sauna, and a Finnish shower, along with spa features such as aromatherapy, aromatic oils, a towel heater, and more. Each suite has two bedrooms, a kitchen, and a dining area. This suite is ideal for people seeking peace and convenience. Offering excellent amenities and services, along with wonderful views, this lovely two bedroom suite with is a Jacuzzi is a perfect place to unwind during your stay in Bariloche.